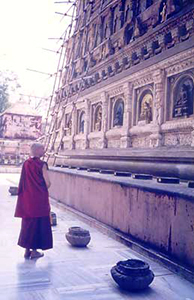 In 1995, I visited Singapore, where I gave Dharma talks at various temples, and Dharamsala, India, where I attended teachings as well as a conference. While traveling, I recalled some short phrases of advice in Dharma texts, and found myself writing others based on my experiences. Each reflection below has a story that prompted it, but each one applies equally to all of us. Let the Dharma touch and transform your heart. Practice the Dharma with love for your teacher, love of the Dharma, love for yourself, love for sentient beings, and the deep wish to make your life meaningful. Let the Dharma touch and transform your heart. This is not the time for intellectual machinations. Integrate your life on and off the meditation cushions. See the truth of the Buddha’s teachings in the events in your daily life. Practice the Dharma in all of these circumstances. Be aware of the results of living your life carelessly. Such an awareness makes you alert; it does not paralyze you with fear. Good relationships with your teachers are important. Cultivate them. Remember the help you have received from your teachers. Let your heart feel grateful, and thereby connected to and supported by your teachers’ care. Be courageous in admitting your mistakes. That is the key to purification and growth. Before you get annoyed, don’t assume you know all the conditions that make up a situation. Whether a teaching is profound or not depends on your mind. Seek help when you run into difficulties. Even if you haven’t sought it, be open when it comes. Listen well to what others have learned in life. Be aware of the kindness of others, especially the small things people do. Treat the people who help you kindly. Avoid becoming arrogant toward them. Take care of the people around you. Remember that your small kindness to them doesn’t begin to scratch the surface of their kindness toward you. Think deeply about the first two noble truths. Recognize clearly the effects of attachment not only in this life but also in keeping you bound in cyclic existence again and again. Don’t avoid or gloss over this, for it’s only when we recognize how we are trapped that we can generate a pure and deep determination to be free. Always be humble. Remember you are the servant of others. Don’t think that because you are intelligent or know a little Dharma that others should respect and wait upon you. If this point is neglected, all your knowledge will become poison for yourself and others. Be equanimous to how others treat you, to whether they appreciate you, know who you are, and so forth. If a friend says something that disturbs you, don’t remain silent and close off to them. You may be imputing something they did not mean to their words. With humility, not anger, tell them what you thought and felt, and listen to what they say to clarify. Be clear on your ethical values and resolute in living according to the precepts. Don’t let the opinions of those who don’t understand the Dharma deeply sway you. Karma is powerful. Don’t diminish its importance. Don’t discard a practice because it is too difficult for you to do now. Practice at the level you’re at and aspire to do the more advanced practices in the future when you’re ready. With a kind heart, help your good friends by pointing out when they are stuck. And when a trusted friend points out your mistakes, listen with an open mind and honesty with yourself. When you’re angry, bitter or cynical, don’t look so much at the object of your attitude as at your own mind and ask yourself, “How do I feel? Where is this disturbing attitude coming from?” By understanding yourself, you will be able to release it. Be willing to question and doubt your own opinions. They are not you. Recognize that things assume great importance simply because they are related to the self. They are not inherently this way. Reflect on impermanence to help put your priorities in order and to know clearly what is important. You never know who will help and who will harm, so abandon attachment and aversion and respect all beings. Recognize your repeated patterns of unproductive emotions. Feel them without getting distracted by the conceptualization and stories that attend them. Know them, but don’t take them too seriously in the sense of thinking their way of viewing the self and the world is correct. What may initially appear to be an obstacle may be for the better in the long run, so don’t get stuck in your current assessment of a situation. Don’t manifest hierarchy where there isn’t any. Don’t assume you’re the only one with problems. Be able to laugh at yourself and your difficulties. Accept the responsibility for how your actions influence others and be willing to listen to others’ feelings. When you have lived through certain difficulties, don’t abandon the people who still have them. Compassion, not arrogance, is called for. Watch the object to be negated. Rejoice and join into others’ happiness.